The Green Band was *sew* excited to start the Cloth Arc! With a number of seasoned designers, weavers and tailors in the band, the Greenies could not have been more eager to pick up their needles. 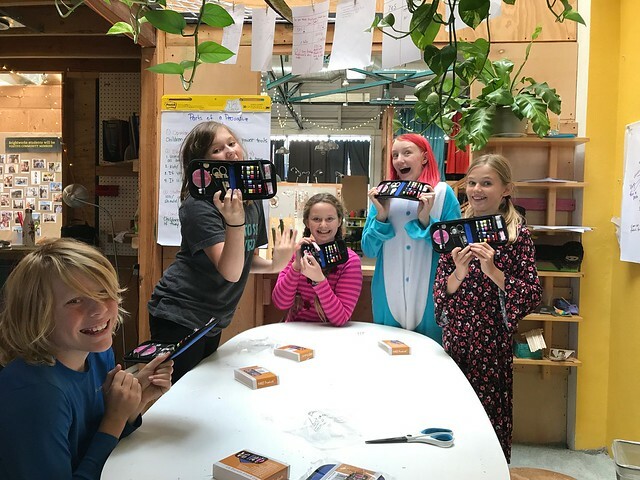 The Green Band was so excited to get their travel sewing kits! For the first few weeks of the Cloth Arc, we have been focusing on what clothes represent. We asked ourselves questions such as “What is my favorite item of clothing and why?” and “What can we learn from looking at someone’s clothes?” We’re currently reading a book, The Education of Margot Sanchez, in which a young girl steals her father’s credit card to buy clothes to fit in at her new school. We’ve come to realize that clothing is a very significant way for people to express themselves. This led us to our first big exploration— we studied the history and tradition of dress codes, the pros and the cons. Students picked one perspective to argue and and a medium to express their persuasive argument. As a band we created a movie, comics, a coding animation and a short essay. Some Greenies challenged themselves by arguing the opposite of their real opinion. 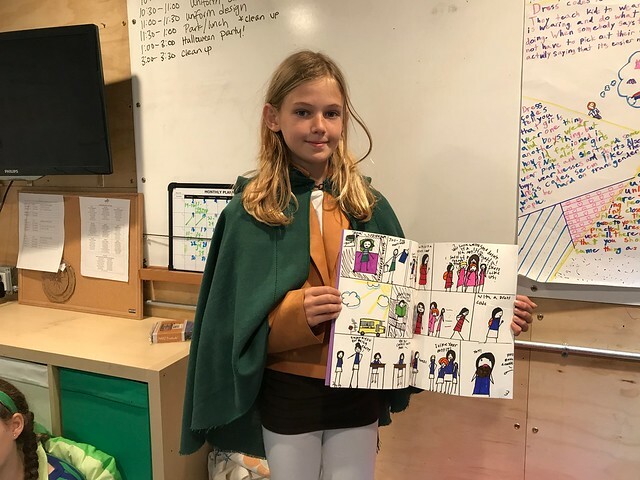 Lucy showing her pro-dress codes comic book. 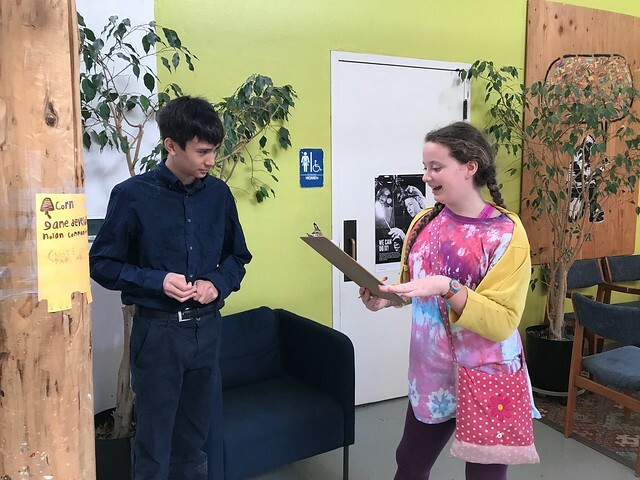 Greenies also *gathered* together to survey the Brightworks community in order to collect some data and statistics to use in their persuasive argument. As a school with no dress code (except to wear shoes in the shop), the Green Band found that 100% of Brightworks students and staff would like to keep it that way. There was no way to *alter* their opinions. We also discovered that most people find dress codes to be sexist and unfair towards women and transgendered people, and that a majority of BWX students and staff have had a dress code or uniform at a past school. Piper surveying Magenta-bander Aiden about dress codes. Because the Green Band was itching to start making something, the Greenies decided to design their own hypothetical Brightworks uniforms. (Funny how nobody wants a dress code or uniform, but everybody wants to design one!) 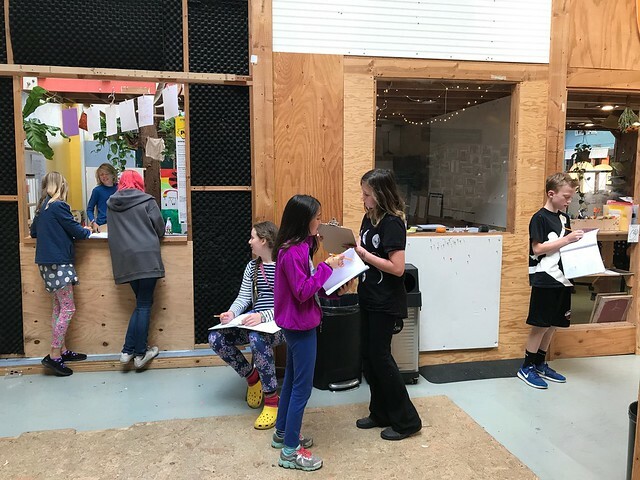 Partially inspired by an episode of “Project Runway: Junior,” students explored the school space to find inspiration for their uniform design. We also brainstormed what we look for in our favorite clothes and what we’d want to put in our uniform. Qualities included durability, breathability, and pockets, obviously! Greenies creating their designs inspired by the Brightworks Space. After designing our uniforms on a 9 head figure (used by professionals for fashion), students made patterns of one or two items from their uniform using clothes that they already own. For some of us, this was the first time making a pattern, and we found it involved way more steps than simply tracing your clothing item! 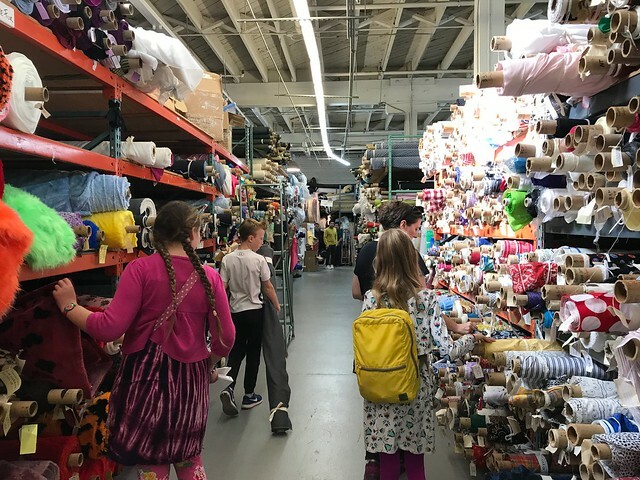 We then hit Discount Fabrics, where students had a $20 budget to buy fabric for their item. Piper, Griffin, Marci and Lucy at Discount Fabrics. That’s as far as we’ve gotten so far, but stay tuned to find out what happens next on Project Brightworks.